Amid intense talks in Washington over the fate of undocumented students in the U.S. with legal protection, Jeff Bezos — Amazon founder and CEO, Washington Post owner and frequent target of President Trump — and his wife, MacKenzie, donated $33 million to a scholarship program that helps thousands of immigrant teens pay for college. Announced on Friday, the contribution to TheDream.US is the largest in the nonprofit organization’s history. Jeff Bezos, who recently became the richest person in the world, is himself the son of an immigrant. 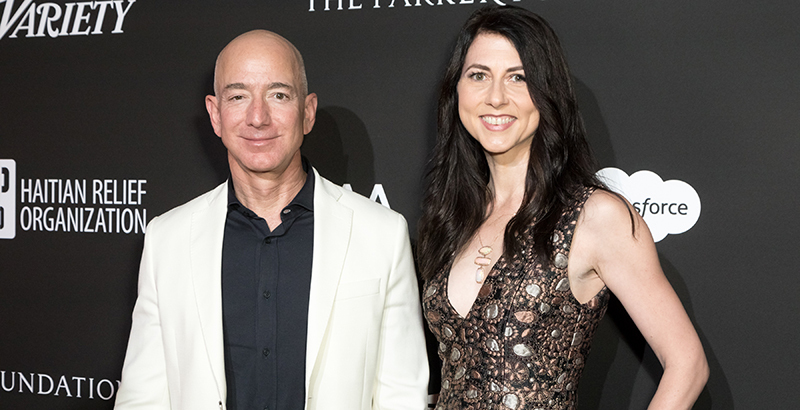 The immigrant experiences of his father, who fled Cuba to the U.S. when he was 16, helped motivate the gift, Bezos said. Though the timing may be coincidental, Friday’s news caps off a busy week for U.S. immigration policy: The Trump administration announced the end of Temporary Protected Status for nearly 200,000 people from El Salvador; a federal judge in California ordered Trump to keep DACA protections in place until lawsuits against its rollback are resolved; and the president caused public outcry after he reportedly decried protections for people from “shithole countries” like Haiti and El Salvador. TheDream.US scholarship program awards $33,000 in financial aid to high school students — over the course of four years — who are recipients of Deferred Action for Childhood Arrivals, or DACA, which provides work authorization and deportation relief to undocumented immigrants who were brought to the U.S. by their parents as young children. The money can be used at 70 partner colleges in 15 states, and 2,850 students are currently enrolled in college through the program. The donation, the group said Friday, will extend scholarships to an additional 1,000 students. Eligible students have until March to apply. The announcement comes at a time of uncertainty for DACA recipients, who are not eligible for federal financial aid or most state aid, and who often express uncertainty about their ability to afford college. Trump announced last fall he would phase out the DACA program, which has provided benefits to some 800,000 undocumented immigrants since its launch in 2012. An estimated 65,000 teens who are DACA recipients or are eligible for the program graduate from high school each year. Trump’s announcement about DACA’s end sent shockwaves into classrooms across the country and prompted heated negotiations in Washington to reach a permanent, legislative fix. Trump has maintained he wants billions in federal money to pay for a wall on the U.S.-Mexico border in exchange for a DACA deal. Disclosure: TheDream.US and The 74 receive financial support from the Bill & Melinda Gates Foundation and Bloomberg Philanthropies.